Rupaul’s Drag Race isn’t expected to return to VH1 until 2019, but drag culture is full force this month. In fact, with so many shows and events in the Big Apple alone, you could say September is New York drag queen month. Of course it all kicked off September 1 with Wigstock 2.HO, the star-studded revival of Lady Bunny’s iconic 1990s drag festival. Neil Patrick Harris and hubby David Burtka reached out to Bunny about resurrecting the event, which moved to Pier 17 in Lower Manhattan. The all-star lineup included Drag Race faves, fresh faces and veteran downtown performers like Joey Arias, Kevin Aviance, Flotilla DeBarge, Sherry Vine, Linda Simpson, Lypsinka, Murray Hill, Raven O and Varla Jean Merman. This weekend, the drag magic sails across the water to Maspeth, Queens, for Bushwig on September 8 and 9. While Wigstock draws the masses, Bushwig is by the kids, for the kids, with an edgier Brooklyn feel. This year’s performers include Horrorchata, Merrie Cherry, the Boulet Brothers, Untitled Queen and Mahlae Balenciaga, as well as New York-based RPDR stars like Sasha Velour, Aja, Shea Couleè, and Thorgy Thor. Also on September 9, Velour makes her New York Fashion Week debut with a collaboration with Opening Ceremony on the hip label’s spring-summer 2019 collection. Sasha Velour hits Bushwig before taking the runway at New York Fashion Week. On September 14 at 7pm, New York queens Paige Turner, Sutton Lee Seymour and Jackie Cox perform their semi-autobiographical jukebox musical, You Don’t Own Me! at the Laurie Beechman Theater in Hell’s Kitchen. It’s a tale of sisterhood, friendship and competition told through music from Priscilla Queen of the Desert, The First Wives Club, Hamilton and Sondheim’s Company. Then at 9:30 Drag Race winner Raja takes the Laurie Beechman stage with the New York premiere of her new solo show, “Masque.” This evening of song and story is inspired by the elaborate staged evenings that were considered the height of artistry in 1600s England (until the Puritans shut them down, anyway). 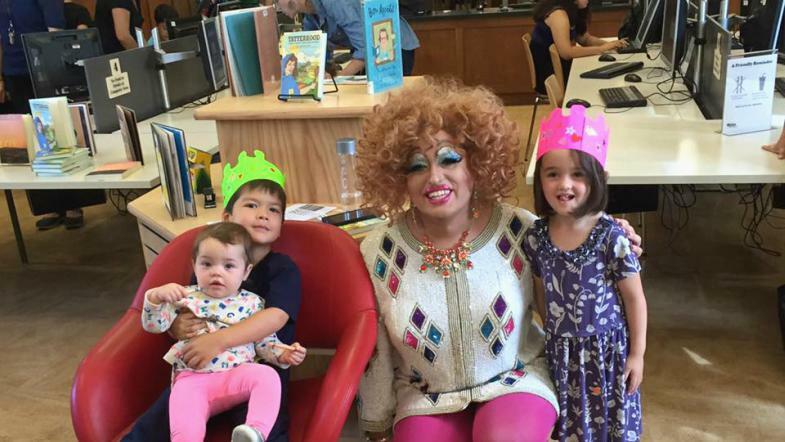 Held at library branches around the city, the ongoing Drag Queen Story Hour fosters a love of reading (the good kind) while introducing kids to the idea that being different isn’t a bad thing. On September 15, DQSH comes to the Brooklyn Book Festival at Metrotech, where Angel Elektra and MorMor Erlich will host a story hour and workshop where kids learn about drag history, come up with their own drag names and even create their own drag-queen puppets. Another Drag Race fave, Monet X Change, arrives at the Beechman on September 20 with “Call Me By Monet“, running through September 23. This night of black comedy and soulful blues is already sold out, but you might be able to beg, borrow or steal to get a ticket. Get a cinematic education with your drag on September 24, when Hedda Lettuce continues her residency at the East Village’s City Cinemas with Hedda Presents the Classics. 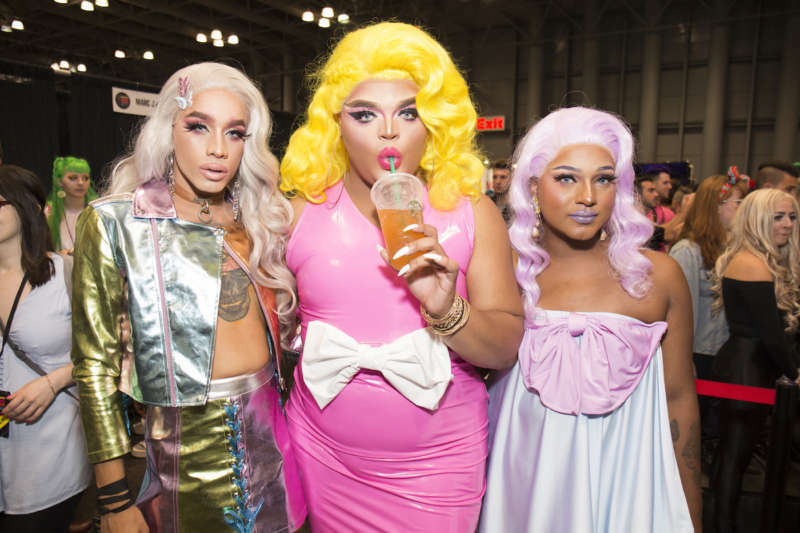 New York drag month closes out with the biggest event of the season: RuPaul’s DragCon NYC, invading the Javits Center from September 28 to 30. RuPaul’s DragCon NYC takes over the Javits Center September 28-30. The third annual event promises loads of signings, performances, panels and merchandise tables — plus a kiki with RPDR judges Michelle Visage, Ross Mathews and Carson Kressley; RuPaul chatting with New York Times columnist Charles M. Blow; and a reunion of Katya and Trixie Mattel. Still need more New York drag in your life this month? Nearly every gay bar in town — and a few straight ones — has a regular drag night. Tie one on at drag brunch at La Pulperia in Hell’s Kitchen or Intermezzo in Chelsea or book at table at the city’s drag-centric restaurants, Lips NYC and Lucky Cheng’s. And the Copacabana serves up food and female impersonators every weekend at Diva Royale. Feeling lucky? Try drag bingo with Linda Simpson at Le Poisson Rouge’s Le Bingo or at Narcbar at the Standard in Cooper Square, where Miss Ogeny calls the numbers. This month, though, everyone’s a winner! How are you celebrating New York Drag Month?